Japan is an archipelago less than 4% the size of the United States yet has the world’s third-largest economy. Tokyo, its capital since 1868, is on the island of Honshu, bordered by Chiba, Saitama, and Tokyo Bay. Doll making is one of the major industries in Saitama prefecture, just north of Tokyo. We visited one of the largest shops. Suzuki Ningyo Atelier and Showroom in Iwatsuki, “Doll Town”, the only one producing all components of the dolls. 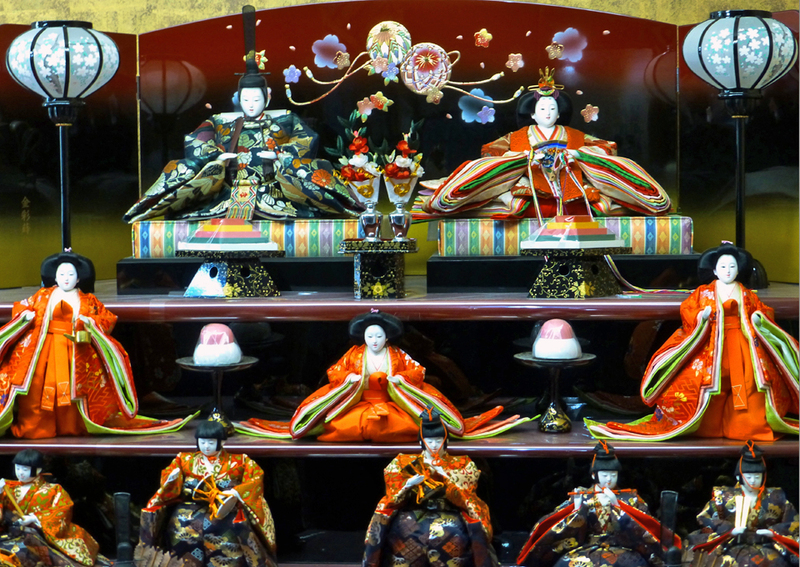 Japanese Hina (Emperor and Empress) dolls are a tradition that dates back to the Edo period. They are elaborately dressed in Heian period (794-1185 AD) nobility style. Parents and grandparents buy dolls for a newborn in hope of healthy growth. It takes seven or eight years of training to make these dolls. Mr. Suzuki and his staff were attending to intricate details in the workshop. The multi-floored showroom has a wide range of dolls, many costing thousands of dollars. Imperial dolls top the full seven-step display, followed by courtesans, musicians. ministers, samurai, and decorative accessories. We also stopped at Sakaeya, a kimono shop owned by Keiko Ochi, who opened her shop over fifty years ago at the age of twenty-five. Kimonos are worn on special occasions–weddings, tea ceremonies, and the Shichi-go-san (Seven-Five-Three) Festival in November for 3, 5, and 7 year olds. A custom-made silk kimono, obi and accessories can easily cost 2,000,000¥ (nearly $25,000) without the obi (sash), but a day’s rental runs about 8000¥ ($100). Dinner was at Shindouyamaya, a ryokan, or traditional owner-operated inn. It’s the ultimate experience in Japanese customs and gracious service. Head chef Ishida’s colorful and elaborate eight course meal was based on traditional kaiseki style food and was served in a traditional sukiyazukuri-style private dining room with a tatami-matted floor and sliding partitions. Meals average about 8000¥ ($100). Shoes are not worn indoors, and if you stay overnight at the ryokan, you will be given a yukata and slippers to wear during your stay. The nakai-san in charge of the room brings tea and sweets, serves food, and set up the fluffy futon that is used for sleeping on the tatami, or woven rice straw, floor. 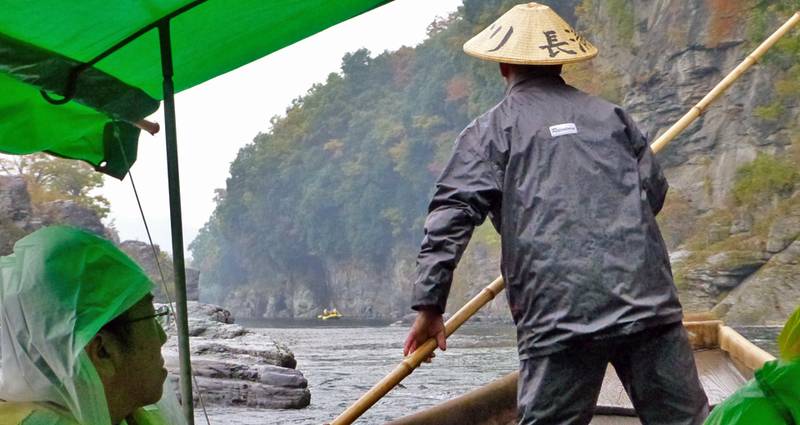 Scenic river boating in traditional Japanese longboats shouldn’t be missed. Two skilled boatmen maneuver with long poles down the calm and sometimes white water of the Arakawa River gorge in Nagatoro’s Chichibu-Tama National Park. The boats pass beautiful rock terraces that have been named a natural national monument. The disembarkation area leads to a lively shopping street featuring local foods like the chewy local soba noodles, vegetable pickles, and fish on long skewers that we enjoyed during our traditional lunch with a river view at Hanamizuki in Chosei-Kan.
For a taste of Edo we headed for Kitain Temple, in “Little Edo”, as the castle town of Kawagoe is known. The temple was founded by a monk in 830 A.D and dedicated to the Buddha of Unending Life. It burned down and was rebuilt as three temples in the 13th century by Emperor Gofushimi. Kitain became the main one because of a friendship between its head monk and the first Tokugawa shogun, Ieyasu. Shogun Iemitsu had several buildings moved here from Edo Castle, including the room where he was born. Since Tokyo’s Edo Castle was destroyed in the Great Earthquake of 1923 and World War II, these sole remaining buildings are national treasures. The town’s Warehouse District looks much as it did during its prosperous Edo era trading days. The custom designed kurazukuri-style warehouses and stores have shutters and thick walls to protect against fire and intruders. Candy Alley is nearby, with Taisho period (1912-1926) architecture and old-fashioned shops with a variety of traditional treats, some made of locally grown sweet potatoes. We walked beneath the Time Bell Tower, symbol of the city, originally built about 400 years ago by the feudal lord. The present tower was built in 1893 after the Great Fire and sounds several times a day. On our way to dinner we passed an enormous Christmas tree display created from illuminated water bottles. A few minutes later, we arrived at Kappo Fukutomi for kaiseki-style cuisine graciously served by women in kimonos. Over 70% of Japan is covered by lush, forested mountains, and we hiked one the next morning. The popular Mt. Mitake has a paved pathway all the way up to the Shinto Musashi Mitake Jinja Shrine, founded in 90 BC and among the oldest in Japan. A cable car leads to an area with shops and refreshments. Stands sell wasabi and rice balls on sticks, and picnic tables have an extraordinary view. There are colorful maples and soaring pines along a pathway lined with plaques marking places to watch for birds or flying squirrels. A red gate marks the spiritual area and steep approach to the shrine. We had a delicious lunch of tofu in many delicate and decorative forms at nearby Mamagoto-Ya. The 150 years old building overlooks the mountains and Tama River valley. The area’s Ozawa Sake Brewery has been in the same family since it was established in 1702, when samurai ruled Japan. Sake is thought to be a spiritual spirit that connects a person to god and Shintoism. Employees assemble in morning to worship before the family altar. We sniffed, swirled, and savored sake in white cups embellished with the company logo, a crab, whose presence indicates the clean river water necessary for high-quality sake. Blue rings inside the cup revealed the sake’s clarity. Free tours and tastings are offered daily except Monday. We then headed for the Japanese Hair Comb and Hairpin Museum, run by the second son of the Ozawa brewery family. The company bought all 50,000 pieces from a collector in 1998 and displays about 5,000 each season. Elaborate hair styles and ornaments became popular around the time the sake company was founded. Ivory combs for a samurai’s wife, birdcage hairpins for brides, and styles for samurai concubines were among these indicators of social standing. Japanese customs had become a part of us. We bowed as we left, bringing home our most treasured memory — the gracious traditions that bring people together.